First of all we would like to say Happy New Year! Hopefully everyone had a blast during the holidays and you’re now refreshed and ready to make 2019 the best year of them all. Thank you for your support and your patience. It means a lot to us and we will do our best to not let you down. In this post we want to share a little bit of our future plans and add some information about our team and what is going on in the company right now. 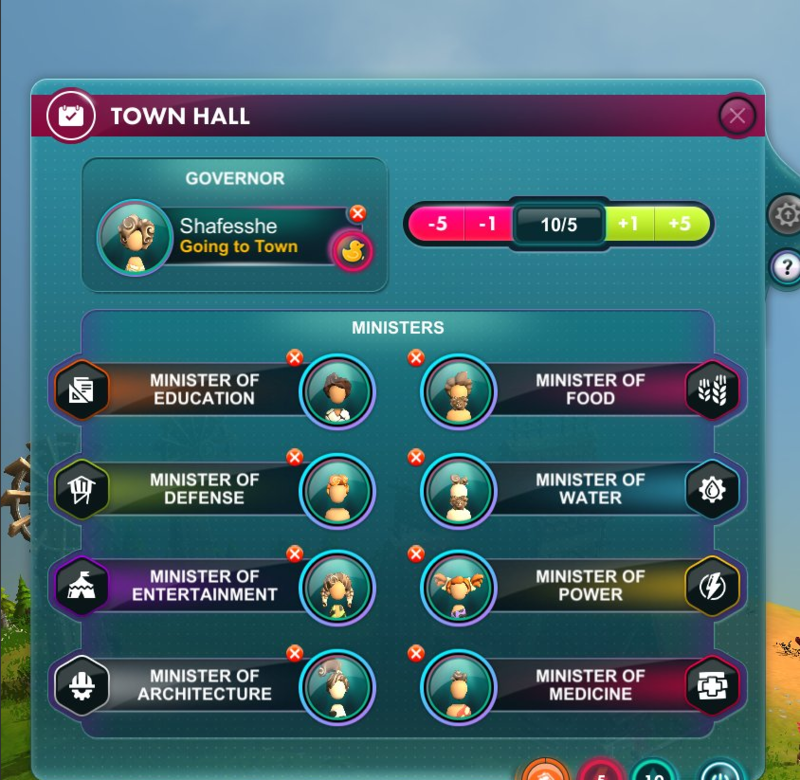 You will be able to assign ministers in the Town Hall. Each minister will be responsible for a specific set of buildings that perform a distinct function. For example, the Minister of Agriculture will be checking if there is enough food in your civilization and if your civilization is lacking food, they will order your nuggets to build an extra source of food such as a farm. The Minister of Water will help you by building water pumps when you are very close to a water shortage. This should substantially help you to manage your civilization and try to help you avoid shortages. We would love to hear some feedback about this new mechanic after you play it. We did our best to balance it and make sure that it is useful, but we know how hard it is to get it perfect and everyone's feedback will be useful to help us make it just right. If we can do something better, we want you to tell us. While we are already in the Modern age, there are still some tweaks that were needed to be done for the Medieval Age. Roads and decals for the Medieval buildings have been added, giving a more rustic and appropriately dark age aesthetic to your civilization. Only with less mud somehow. We’ve also done some adjustments for the telekinesis god power. You are now able to pick up any resource pile, kill animals to generate food, and transport those resources to any buildings that will require them. Especially useful when your nugget gets stuck down a well and can’t bring that pile of refined stone to your brand new buildings, halting in its tracks your manifest destiny into the brave new world of the future. These are some of the changes that we’ve made over the past two months and wanted to share with you. There are also many small and not that small, but still very important changes like bug fixes, UI changes, tips additions, performance optimization, and many others that will provide a more pleasant experience for everyone. Please, leave your comments below or in our discord channel and let us know what you think about the new stuff coming in February! We look forward to talking with you about them. The official patch update will be released on January 25th, where you will be able to find out in more details about each system that will be introduced with a new patch. Now it is time to share some things about Crytivo itself. Some members from Crytivo are going to be attending and representing the company at PAX South in San Antonio, Texas. So shout out to anyone local and if you like what we do, would like to chat with us, play games, or simply grab some chameleon swag, please come and join us at booth# 10494. We really look forward to hopefully meeting some of you in person and getting the chance to know you and for you to know us. We love you all for the support and fun we’ve had with you in 2018 and we truly believe that with all of us together, we can achieve many great things in 2019. Thanks to everyone who supports us and appreciates what we do.